Senior Business Development Executive Jeff Durbin’s achievement is a result of his dedication to helping Chamber members succeed. Jeff Durbin, Senior Business Development Executive, Greater Phoenix Chamber of Commerce. The main ingredient to Jeff Durbin’s remarkable career as a senior business development executive is connecting Valley business owners with the vast array of tools and services provided by the Greater Phoenix Chamber of Commerce (GPCC). Add in generous servings of integrity and honesty, top it off with a handshake and you’ve created an award-winning recipe for success. Durbin was recognized with the Platinum Lifetime Sales Achievement Award from the Association of Chamber of Commerce Executives (ACCE) during its 2016 annual convention in Savannah, Georgia. The award recognizes chamber employees around the county whose lifetime sales figures have eclipsed $750,000. Although Durbin’s actual lifetime sales figure is more than $900,000, he measures his success in Chamber members assisted, not dollar amounts. And after a business joins the Greater Phoenix Chamber, Durbin keeps in contact to be sure it is using the many benefits that accompany membership. Durbin has been in the Chamber business for nearly 13 years. He sold his first Phoenix Chamber membership in February 2010 on his second day on the job, to Big Brothers Big Sisters of Central Arizona. His challenge that day was to be sure he was citing the correct membership benefits, since he had just moved over from the Tucson Metropolitan Chamber of Commerce. 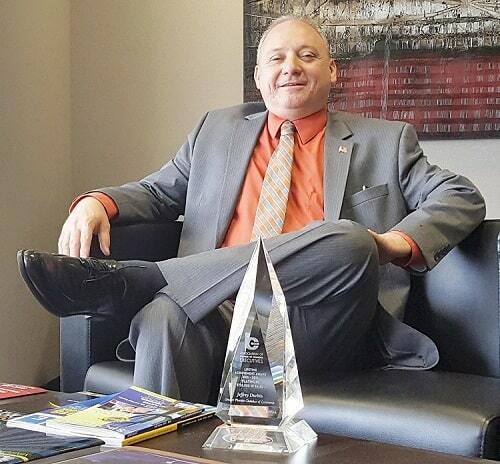 After winning a lifetime achievement award, it’s easy to wonder how Durbin has found continued success in sales, typically a high-turnover profession. His keys are: know what product you’re selling and actually believe in it; be honest; follow up; and above all, have passion. Durbin’s longevity and recognition in the sales business doesn’t mean that each day is a cakewalk for this seasoned pro. Even though he works for the largest Chamber in Arizona, Durbin still tries to welcome every single new member to GPCC with a handshake, the power of which he learned in his first sales job with American Greetings Co. in Cleveland. “People like handshakes. They represent a tangible commitment and are used less and less these days. But that’s how I like to do business,” he says. Durbin isn’t one for talking about his own accomplishments too much, so he recognized his achievement by also giving credit to others. – Interested in learning how GPCC can benefit your business? Want to make sure you’re taking full advantage of your existing membership? Want to talk about the Cleveland Cavaliers NBA Championship? Contact Jeff Durbin at (602) 495-6482 or email jdurbin@phoenixchamber.com.